Patrick's birthday came and went and was a success! He had school, because it wasn't on a weekend, so he got to see his friends. When asked what cupcakes he wanted to bring he said PJ Masks, of course but then asked that there be Princess Cupcakes for the girls. The store didn't have princess cupcakes so he took a dozen pink Poppy Troll cupcakes with him instead, and they were a big hit. 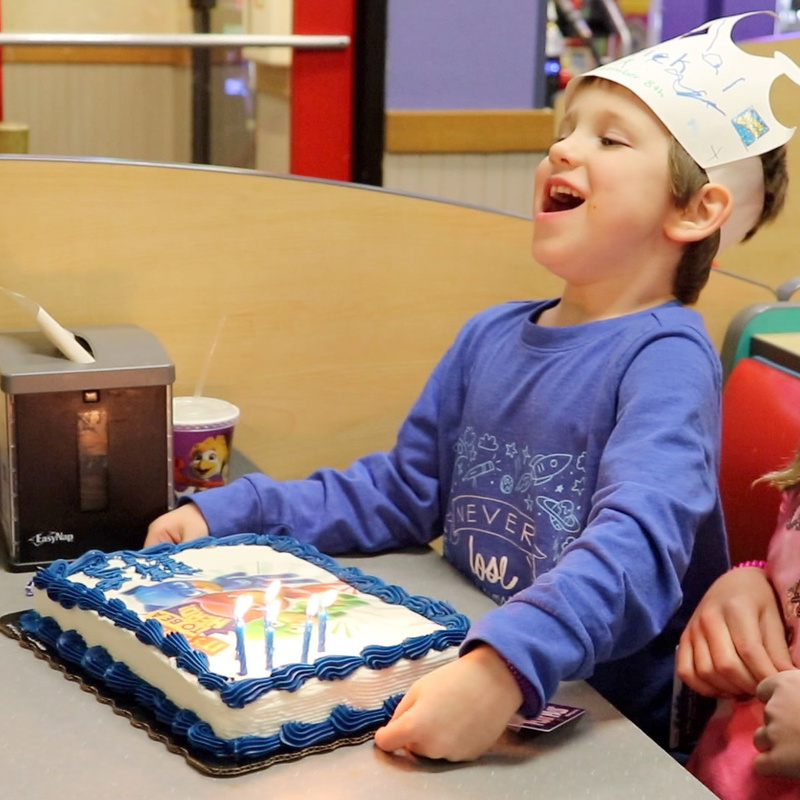 And then he had a PJ Masks birthday party with our family at Chuck E Cheese after playing at the local science museum waiting for Mae to get done with therapy, that afternoon. Both were lots of fun. A certain someone did briefly try to make a break from the birthday party after the cake, I think because she was a little overwhelmed, and I was surprised that she was tiny enough to fit between the bottom of the booth divider and the floor (when she went down there I thought, "at least there's no where she can go"), which meant she nearly made it to the door, which was right on the other side of the wall of booths, and would have if I hadn't managed to catch hold of her boot. 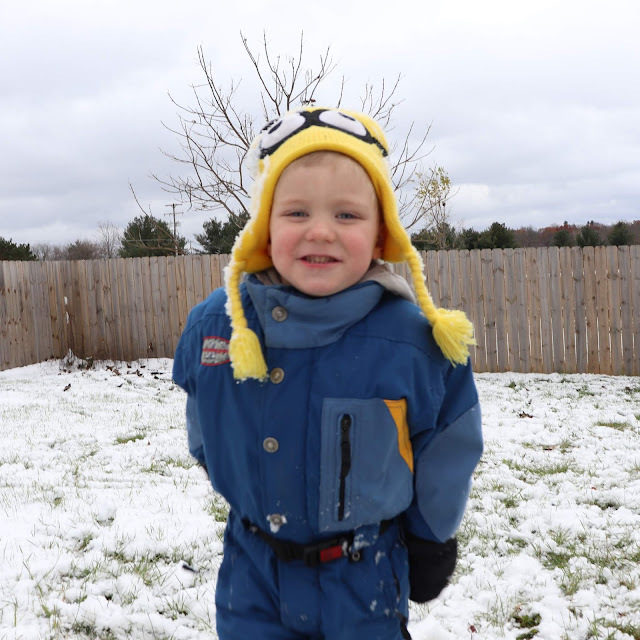 Winter has arrived in Michigan and bundling up five kids to go out and play in the snow gives me a renewed admiration for any of the kids teachers. Especially the little kids teachers. 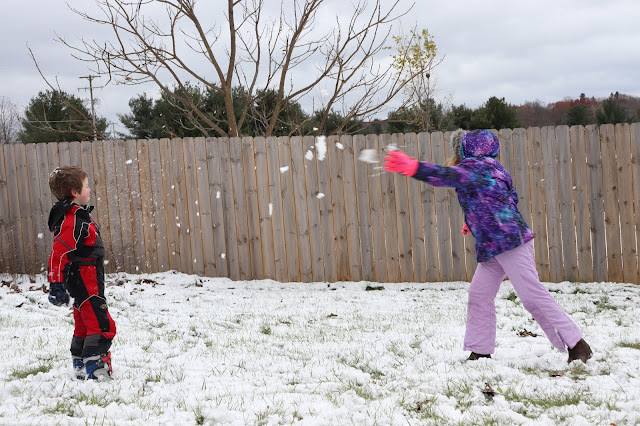 I have no idea how going out to recess must work in a kindergarten or preschool classroom, where all that snow gear must take an hour to get on, based on how much help the 3-6 crowd around here usually needs with this sort of thing. Even Patrick, who is getting pretty good at handling some of his snow gear, still needs helps with the trickier parts that he can't quite get on his own. So it takes us about thirty minutes of prep time to get everyone ready to go outside. And I don't open up the door to release the first kids into the cold, until everyone is ready, so that the first kids aren't complaining that they're cold and ready to come back in, just as the last ones are ready to go out and ready to play. I've learned my lesson from years past. However, this lesson doesn't make getting ready particularly fun, since the four year old was the first one dressed and must have asked "when are we finally going to go out" at least seventy five times, before I'd gotten Patch, and then Maggie, and then Tessie, completely bundled, from head to toe. Thankfully Sadie can get ready entirely on her own. I'd forgotten that one of Maggie's scripts, which I hadn't heard in an entire year, was "swim in the snow." She hadn't though. Within ten minutes of coming outside, after reminding me that it had been too long since she'd had a shake at McDonald's and after we'd gone through that script enough times to convince her that I'd understood sufficiently, she announced that she was ready to swim in the snow and then went through her script about the Bubble Guppies swimming in the snow. I love her memory and how she can call up a script that she hasn't used in a year in an instant, in the correct situation. And I love that I got that script on camera. I've watched it back so many times. It's one of my favorites. And lastly here is the video with the update on the sleep study and the surgery. And I know I said that was the last thing but there's one very, very last thing. A bit of blog house keeping if you will. For the past several months I've been thinking really very hard about changing the name of my blog so that all my pages have to same name, so that I'm not operating under a bunch of different names, which can be kind of confusing. I've always struggled with naming, well really anything that isn't a child. Naming kids has always been easy for me. Naming blogs and other blog like ventures? Not so much. The last time I changed my blog name lots of people let me know they hated it. And some people let me know they liked it. Which was okay. You've got have a thick skin in blogging or vlogging or doing anything online and blogging has definitely been slowly helping me work on that for the last decade. The thing was, I really wanted to like my blog name. And I liked the newer name more than the older one. But when I finally came up with my vlog name I actually and really loved it. It just clicked and felt right as a description for the last decade of my life since becoming a parent. So I am going to be changing the blog name on Facebook to a name that matches the vlog (at least in part... it won't have "vlog" in it). And maybe I'll eventually add it to the banner here, since my blog here has been living without any sort of a name posted anywhere for quite a while. And that's what I'm up to at the moment. Woah! This would have been so much fun. I remember my birthday. It was celebrated in one of the event locations just like this. My granny planned it all and it was snowing on my birthday. 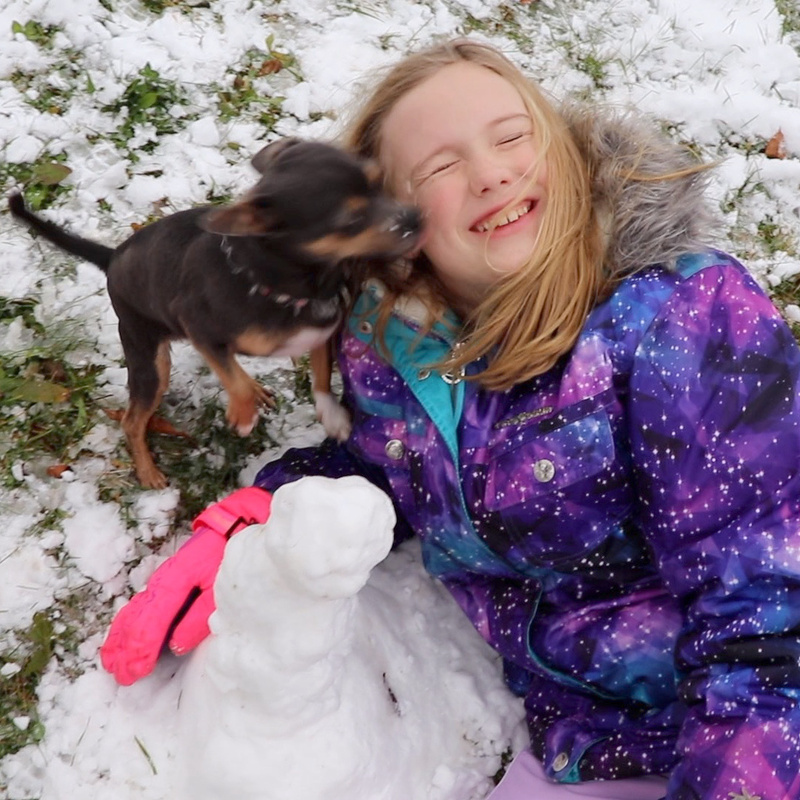 We made snowmen and had a wonderful time. When Will the Decorations Go Up?